Upper Cylinder replacement parts for vintage New Idea No. 17 Manure Spreaders. Spreader replacement parts are still manufactured in the USA by the Amish who are still maintaining and using this vintage farm equipment on working farms. High wear available replacement parts include cylinder heads, bars, teeth, bearing plates, bearings, shields, and sprockets. Priced a la carte, using the drop-down boxes. Select the parts needed and the prices will incrementally add for each part(s) selected. To deselect click on the "Please Select" again. A $12 flat-rate shipping and handling base rate will process with each order regardless of the cost to ship the smallest part(s) sold in the US. Additional shipping cost will be required for larger or multiple parts that exceed the $12 shipping base rate. If possible, please checkout using the PayPal option. We will be able to send you a PayPal invoice for any additional shipping. Otherwise, we are not able to upcharge shipping to a credit card order and will need to call you. We will not know the shipping cost until the Amish shop can verify the order and the cost to ship. Since parts ship directly from an Amish owned business without computers, please expect some orders to take up to two weeks for the order to reach the Amish shop, have shipping verified, additional shipping collected, before it will ship. 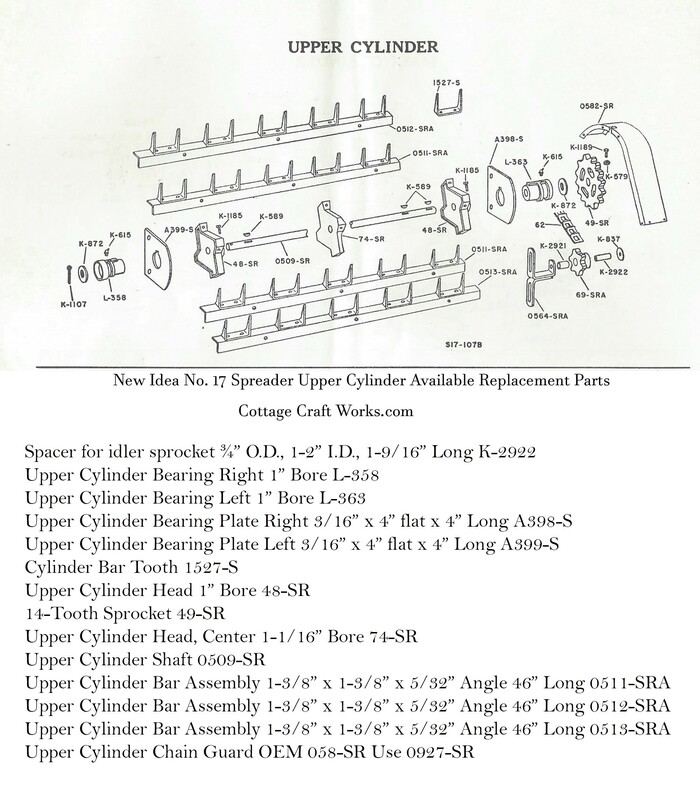 Available New Idea No.17 Spreader Upper Cylinder Parts based on original part numbers. New Idea manure spreaders have been the standard manure spreader in Amish communities for generations and the Amish have continued to rebuild these old-time favorites. All parts are brand new USA Amish made since 1970. Cottage Craft Works provides these hard to find replacement parts for those who want to restore and display or use these vintage farm machine implements of yesteryear. We carry many other replacement parts for the New Idea ground driven spreaders for models, 8, 10, 10A, 12, 14, 17, 18 and 206. Click Here to see all of our New Idea No. 17 Manure Spreader Parts.